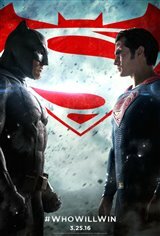 Bruce Wayne's Batman (Ben Affleck) and Clark Kent's Superman (Henry Cavill) are pitted against one another when Batman adopts much of society's idea that Superman is a threat to humanity and the source of Earth's chaos. Even though Batman had retired his cape and mask, he dusts them off as he fears for the future of the world with such great power left uncontrolled. However, as the two square off in a vengeful war, a new dark danger arises, capable of total destruction.